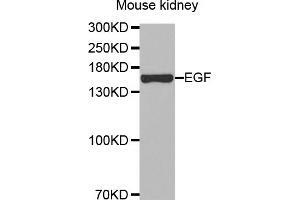 Western blot analysis of extracts of mouse kidney, using EGF antibody at 1:500 dilution. Specificity EGF polyclonal antibody detects endogenous levels of EGF protein. Background This gene encodes a member of the epidermal growth factor superfamily. The encoded preproprotein is proteolytically processed to generate the 53-amino acid epidermal growth factor peptide. This protein acts a potent mitogenic factor that plays an important role in the growth, proliferation and differentiation of numerous cell types. This protein acts by binding with high affinity to the cell surface receptor, epidermal growth factor receptor. Defects in this gene are the cause of hypomagnesemia type 4. Dysregulation of this gene has been associated with the growth and progression of certain cancers. Alternative splicing results in multiple transcript variants, at least one of which encodes a preproprotein that is proteolytically processed. Buffer 1 mg/mL in PBS with 0.1 % Sodium Azide, 50 % Glycerol.